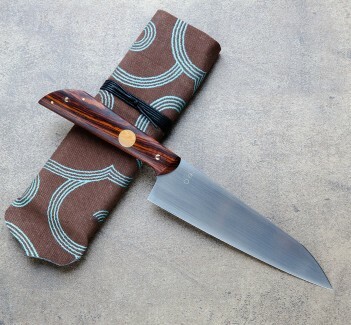 An offering with all the hallmarks of a Don Andrade kitchen tool: ziricote wood with gorgeous grain for the hidden-tang handle, carved to Don's hand-hugging form that you won't want to put down; a blackwood inlay and mosaic pin that ensure with their recognizable aesthetic that there is no doubt about who built this knife; and stunning etched and polished 1095 carbon steel with a differential heat treatment that gives this light and thin blade the final touch to make it a workhorse in the kitchen for any number of daily tasks. And of course a cloth-covered protective case is included. 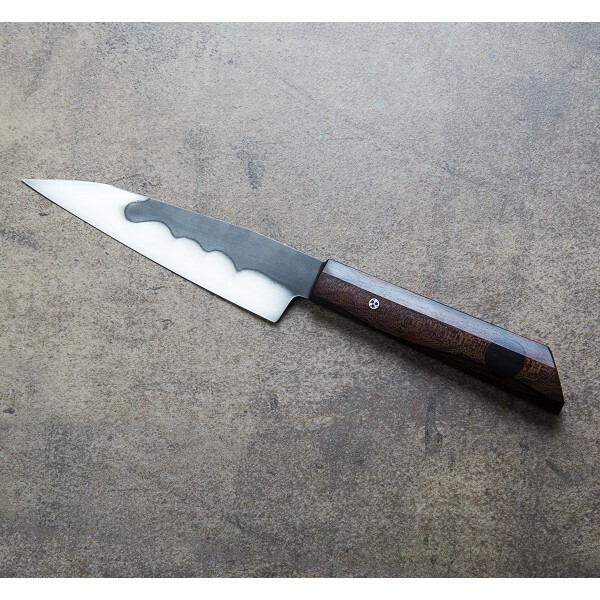 The clean lines of the profile, the marriage of design and function that Don Carlos Andrade is so skilled at, is evident in this recently completed Ziricote Kiritsuke Utility, designed to take over a kitchen and conquer any task thrown at it. 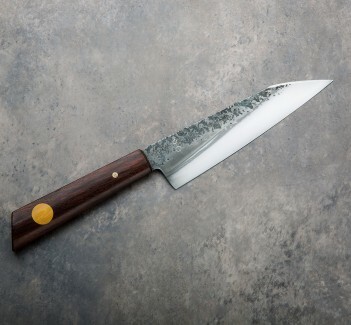 Handmade by Don n Los Osos, California, this unique take on the kiritsuke, like so many of his designs, is emblematic of his wanting to inspire others to cook good, real food for themselves at home - an incredibly versatile blade style interpreted in a new way and employed in an heirloom-quality product that makes us want to begin prepping the next meal right now. 5.875" (155 mm) blade, 11.5" overall. Blade width at the heel: 2.75mm. Blade height at heel: 35mm. Weight: 4.0 oz (113 g). 1095 carbon steel blade with clay differential heat treatment. Ziricote wood handle with blackwood inlay and mosaic pin. Completely satisfied. 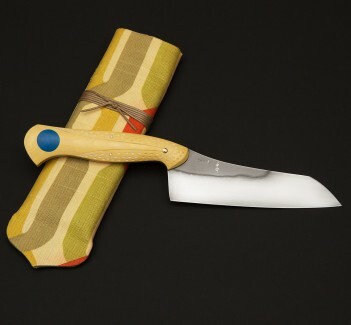 Received this stunning knife promptly, and it came very well packaged. Customer service was above and beyond expectations. 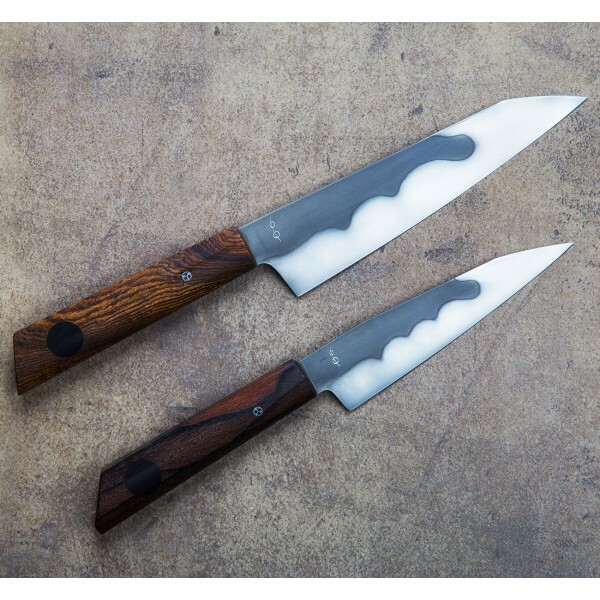 Abe stocks beautiful knives, and genuinely cares about his customers. 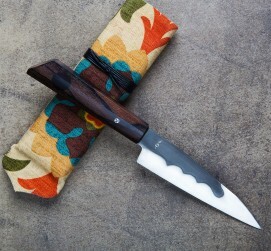 This won't be the last knife I buy from Eating Tools!